I have been using this recipe for many years. It makes an elegant and unique vegetarian main dish for a holiday meal. This lasagna is delicious and satisfying yet much lighter than a traditional cheese laden one. A great crowd pleaser, there is never a drop left at pot lucks or holiday meals. Originally a wheat recipe from a magazine, at our house it has changed over the years into a GF, vegan and soy free version. 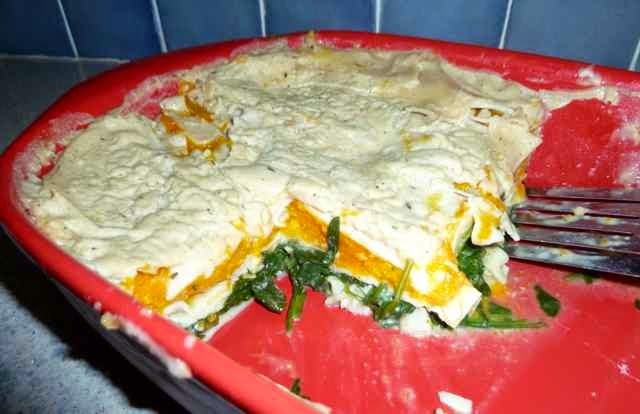 I use GF lasagna noodles instead of wheat ones; I use rice flour and corn starch to thicken the sauce instead of all purpose flour; and to make it dairy free I use a dairy free milk such as almond or rice milk and dairy free parmesian cheese. At our house, our soy free person is able to eat dairy, so I make the lasagna GF and Dairy Free to accommodate the GF and vegan eaters and leave out the parmesian cheese from the sauce. Then the grated cheese is served on the side. I serve real parmesian cheese for the dairy full and soy free folks and vegan but soy full parmesian cheese for the dairy free or vegan ones. If your soy free person is also dairy free just leave out the parmesian cheese all together, it still tastes great. I can’t really tell the difference between the dairy free or dairy full versions, both are yummy. Preheat oven to 450℉. 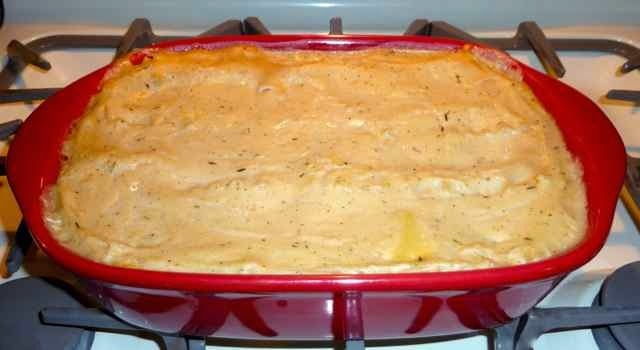 Grease a 9”x13” lasagna pan with oil, set aside. Cut the butternut squash in half, lengthwise, and remove the seeds. Place the squash, cut side down, on a rimmed baking sheet and add 1/4-inch of water to the pan. Bake 30-45 minutes until tender and easily pierced with a fork. Remove from oven and allow to cool down. When cool enough to handle, scrape out the cooked squash from the skin, dispose of the skin. Place the squash in a bowl and mash with a fork until there are no large lumps. Lower the oven temperature to 375℉. Cook the lasagna noodles by boiling them in salted water to which the Tbs. of olive oil has been added. You want the noodles firm as they will get softer after being baked with the other ingredients layered inside. I usually cook them 5 minutes less than the directions on the package and check them at that point. They should be firm and just cooked but not crunchy. Do not let them cook too long and get mushy or the lasagna texture will be off. When cooked, drain the noodles and spread them out on parchment paper so that they do not stick to each other. This is my favorite brand of pasta. 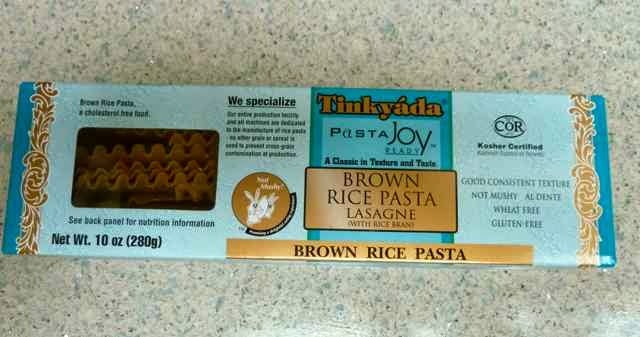 It is just like regular pasta in taste and texture. 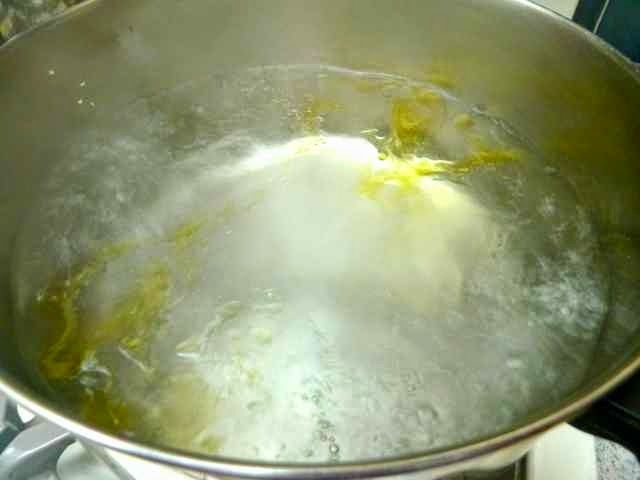 Water salted and boiling with oil added. In a large pan, over medium heat, sauté the thinly sliced or crushed garlic in the Tbs. 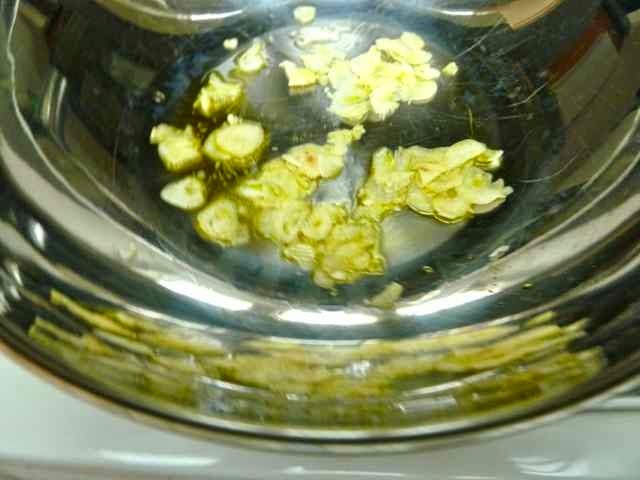 of olive oil for about 30 seconds. Do not let it burn or cook too much as it will be bitter. 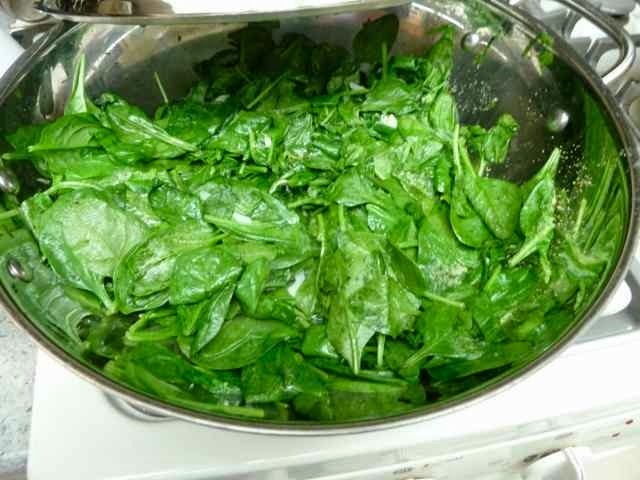 Add the chopped Swiss chard or whole baby spinach leaves and 1/4 cup of water. Stir and cover. Cook until wilted and tender about 7 minutes. Season with salt and pepper to taste. Baby spinach almost all cooked. 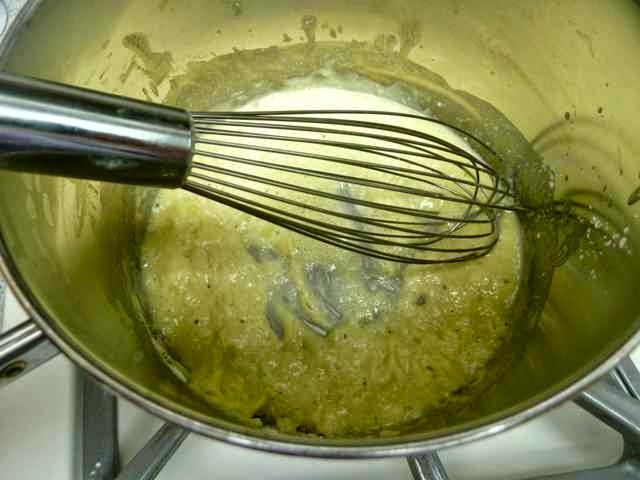 To make the sauce: Heat the butter or oil in a large saucepan and add the corn starch and brown rice flours. Stir with a whisk and cook for 1-2 minutes. Gradually add the milk, stirring constantly with the whisk until smooth. Add the salt, pepper, nutmeg, thyme, garlic and onion and mix in well. Cook, stirring frequently, until the mixture boils and thickens. If using, add the parmesian cheese and stir. Remove from the heat. Adding flours to heated oil or butter. Cooking the flour mixture while stirring constantly. To assemble the lasagna: Spread 1/2 cup of the sauce over the bottom of the oiled lasagna pan. Arrange 4 noodles over the sauce, overlapping to fit. Place all of the cooked Swiss chard or spinach (liquid drained) on top of the noodles. Spread out evenly. Arrange 4 lasagna noodles on top of the greens. Top with 1 cup of sauce. Spread all of the butternut squash evenly over this layer of noodles and sauce. Top with the remaining 4 lasagna noodles. Then spread the rest of the sauce over the top. Sprinkle with 2 Tbs. parmesian cheese, if using. If the lasagna noodles break up a bit while cooking, don’t worry. Save the 4 best ones for the top layer. Use the broken ones for the bottom layers, no one will ever know. Patch the pieces of noodles as best you can to completely cover each layer. ½ cup of sauce on bottom of pan. Some have broken and are patched to cover the pan. Spinach layered over noodles and sauce. Squash spread over second layer of noodles. the last layer of noodles and the rest of the sauce on top. Cover with foil and bake at 375℉ for 30 minutes. Remove the foil and bake an additional 10 minutes. Remove from the oven. Allow the lasagna to cool for 10 minutes before cutting. 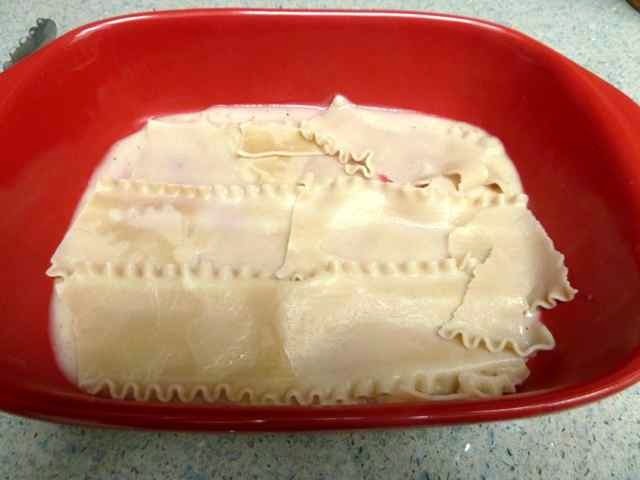 Lasagna after being cut into. 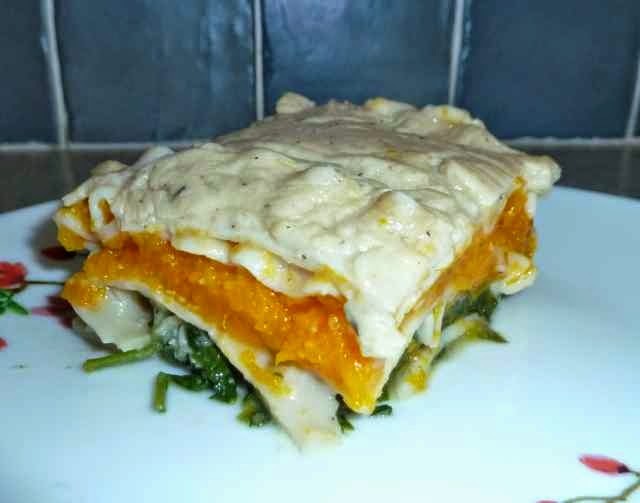 GLUTEN FREE BUTTERNUT SQUASH LASAGNA Ingredients PASTA 1 package/12 GF Lasagna Noodles 1 Tbs. Olive Oil FILLING 1 Tbs. Olive Oil 1 1/2 lbs. Swiss Chard or Baby Spinach to taste Salt and Pepper 5 cloves Garlic thinly sliced or crushed 3 lbs. Butternut Squash SAUCE 2 Tbs. Butter or Oil (for Vegan or Dairy Free use oil) 3 Tbs. 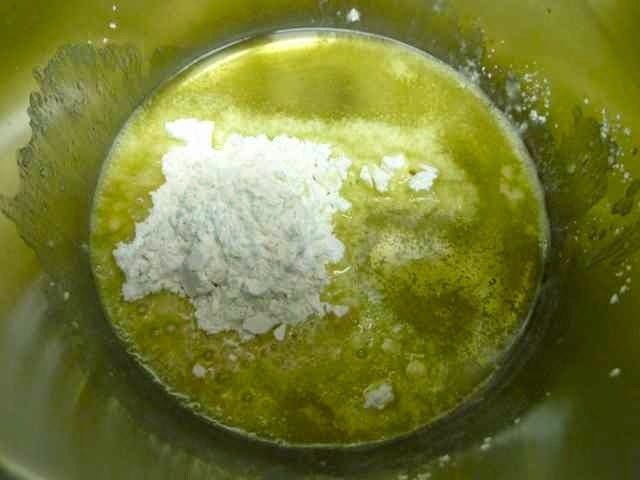 Corn Starch (or potato starch or arrowroot or tapioca starch) 2 Tbs. Brown Rice Flour 1/2 tsp. Himlayan Sea Salt 1/4 tsp. Black Pepper 1/4 tsp. Ground Nutmeg 1/4 tsp. Ground Thyme 1/4 tsp. Granulated or Powdered Garlic 1/2 tsp. Granulated or Powdered Onion 4 cups Milk (for Dairy Free or Vegan use non-dairy milk such as almond or rice) 1/4 cup Grated Parmesian Cheese (for Dairy Free or Vegan use dairy free parmesian cheese such as GoVeggie brand) Optional, can serve on the side or omit all together 2 Tbs. 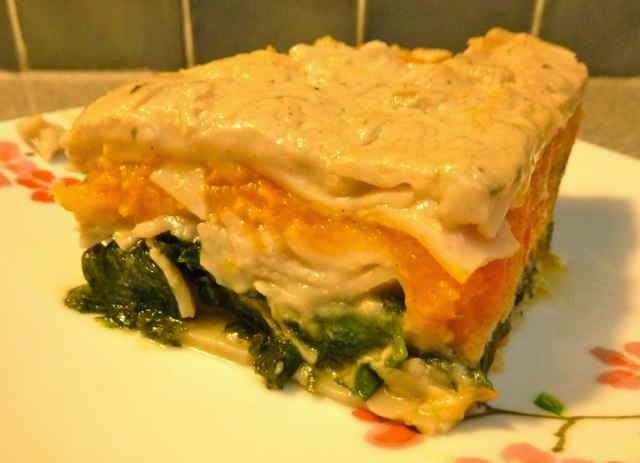 Grated Parmesian Cheese for topping the lasagna (optional) Directions Preheat oven to 450℉. 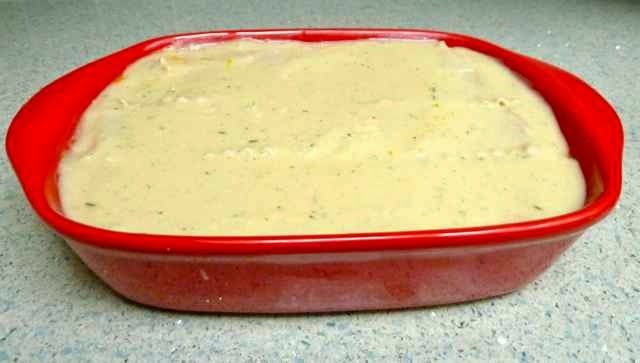 Grease a 9”x13” lasagna pan with oil, set aside. Cut the butternut squash in half, lengthwise, and remove the seeds. Place the squash, cut side down, on a rimmed baking sheet and add 1/4-inch of water to the pan. Bake 30-45 minutes until tender and easily pierced with a fork. Remove from oven and allow to cool down. When cool enough to handle, scrape out the cooked squash from the skin, dispose of the skin. 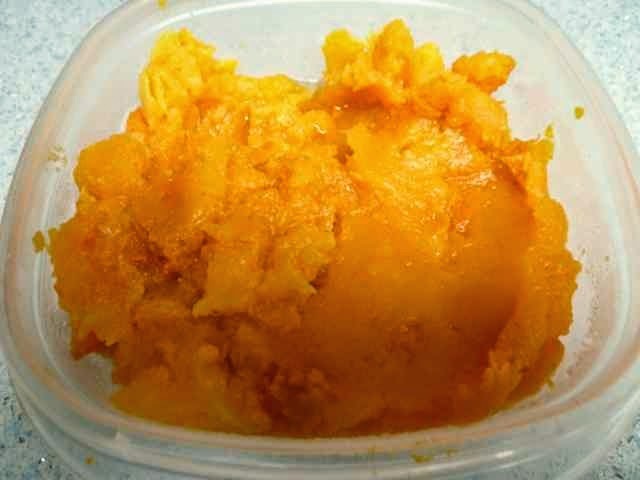 Place the squash in a bowl and mash with a fork until there are no large lumps. Lower the oven temperature to 375℉. Cook the lasagna noodles by boiling them in salted water to which the Tbs. of olive oil has been added. You want the noodles firm as they will get softer after being baked with the other ingredients layered inside. I usually cook them 5 minutes less than the directions on the package and check them at that point. They should be firm and just cooked but not crunchy. Do not let them cook too long and get mushy or the lasagna texture will be off. When cooked, drain the noodles and spread them out on parchment paper so that they do not stick to each other. In a large pan, over medium heat, sauté the thinly sliced or crushed garlic in the Tbs. of olive oil for about 30 seconds. Do not let it burn or cook too much as it will be bitter. 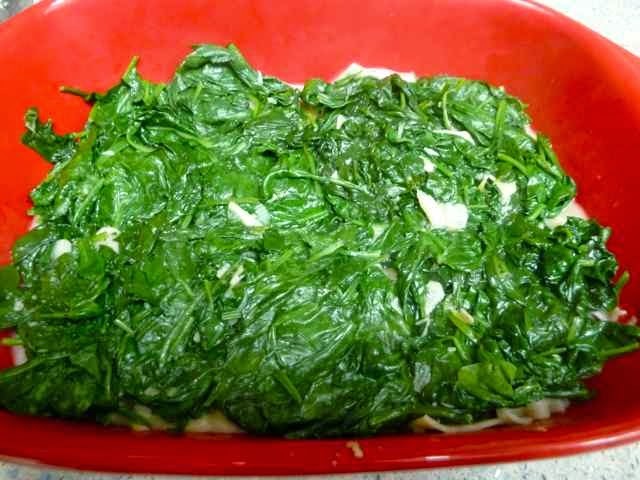 Add the chopped Swiss chard or whole baby spinach leaves and 1/4 cup of water. Stir and cover. Cook until wilted and tender about 7 minutes. Season with salt and pepper to taste. 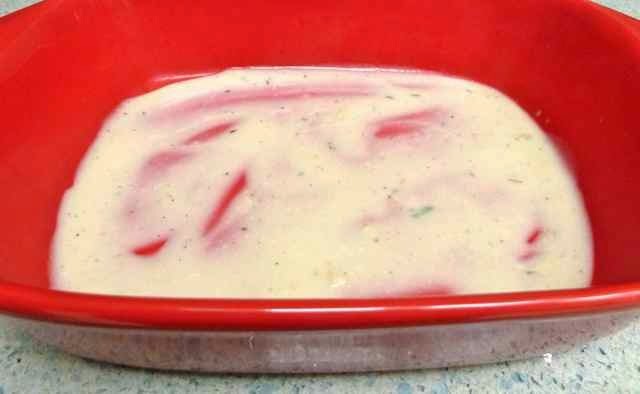 To make the sauce: Heat the butter or oil in a large saucepan and add the corn starch and brown rice flours. Stir with a whisk and cook for 1-2 minutes. 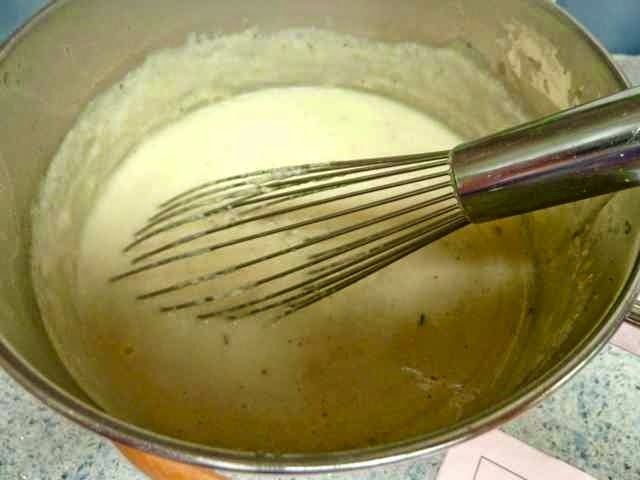 Gradually add the milk, stirring constantly with the whisk until smooth. Add the salt, pepper, nutmeg, thyme, garlic and onion and mix in well. Cook, stirring frequently, until the mixture boils and thickens. If using, add the parmesian cheese and stir. Remove from the heat. 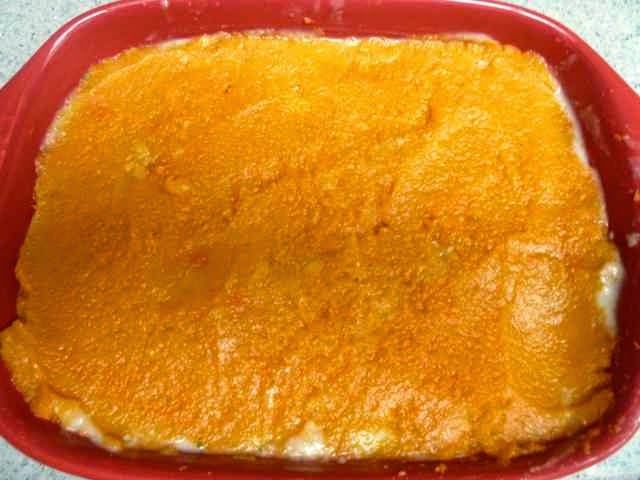 To assemble the lasagna: Spread 1/2 cup of the sauce over the bottom of the oiled lasagna pan. Arrange 4 noodles over the sauce, overlapping to fit. Place all of the cooked Swiss chard or spinach (liquid drained) on top of the noodles. Spread out evenly. Arrange 4 lasagna noodles on top of the greens. Top with 1 cup of sauce. Spread all of the butternut squash evenly over this layer of noodles and sauce. Top with the remaining 4 lasagna noodles. Then spread the rest of the sauce over the top. Sprinkle with 2 Tbs. parmesian cheese, if using. If the lasagna noodles break up a bit while cooking, don’t worry. Save the 4 best ones for the top layer. Use the broken ones for the bottom layers, no one will ever know. Patch the pieces of noodles as best you can to completely cover each layer. Cover with foil and bake at 375℉ for 30 minutes. Remove the foil and bake an additional 10 minutes. Remove from the oven. Allow the lasagna to cool for 10 minutes before cutting.